Did you know that thinking about food all the time, dreaming about food, spending hours planing and thinking about food, collecting recipes obsessively, always making food for others, always baking and cooking but rarely eating it, isnt a healthy mindset? Focusing too much on food, where all your thoughts and time is spent on food is not healthy. But the problem is when all your focus is on food. Now i am going to start off by saying that i might not be the best example here... because Yes, i take food photos, no thats maybe not the healthiest. I am aware of this. Though the reason i take photos is because of my blog - my family know this. Though if you are in recovery or even just a normal person taking pictures of all your food might not be the best idea. It can create this sort of.....i need appraise because i just ate. Especially when it comes to fear foods - and yes, i have been there where i post when i ate a fear food and its like you want to get comments, where people tell you its ok. You want people to tell you that you are strong for eating ice cream or pizza because you might not feel it yourself. But it sort of denormalizes food when you need to start getting appraisal for eating. It makes food a much bigger deal than it is. Because lets be honest... we need food to live. The quote ' Eat to live. Dont live to eat' is quite accurate. Because food is for survival. In recovery, eating should become something normal to you... you need to make it no longer a big deal. Like grabbing an apple after lunch should feel ok if thats what you want, or taking some extra potatoes or going for cake with friends... those should just be normal things, nothing that needs approval or you need to photo or tell everyone. Your day shouldnt circle around your next meal, or what you are going to eat for breakfast tomorrow, or you shouldnt worry about the christmas buffet a week from now or worry about what you are going to eat at a friends party 2 weeks from now. Instead, food should be something you make when you are hungry and eat because you know you need it and want it. (Though remember in recovery, you often need to eat even though you arent hungry!!). Food should become something normal.. you go and eat with your family at dinner time, you eat your snacks at roughly the same time, you eat your breakfast when you wake up... its not something you should over think. It should become something natural. If you have siblings or friends it can help to look at them .- if they arent on a diet or struggling with an eating disorder as well - because then you can see the naturalness of how, when and what they eat. They dont analyze or overthink (or not that others are aware of?) how and what they put on their plate, they eat and they take more if they want or stop when they are full and then eat again when they are hungry.... or say take an extra biscuit just because its soo good. It is natural and that is what YOU need to find in your life as well. Its a balance with food and food isnt the main focus in a persons life. And like mentioned above, i am not the best example of what i am writing about in this post. But the photos are for the blog, and eating is what i do because im hungry and want food. I dont sit around and think about my next meal or plan my food for the day or week... i just eat what im craving. And that is intuitive and healthy eating!! Those food thoughts and counting down until my next meal (even _while_ eating a meal) was the hardest part of my illness. It was just so exhausting. I actually thought there was something wrong with me (other than the obvious), like this was some OCD-thoughs that was going to last forever even though I got healthy. Luckily it is all over now! I am so happy and grateful that I am out of that mess! 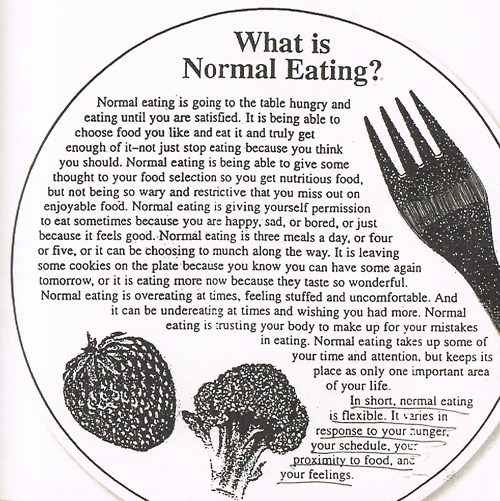 i think the cut-out illustration summarises normal eating really well. I'd add that it is also trusting your body when it does unpredictable things like bloating or changing over the course of the month -- it took ages before I realised that the menstrual cycle isn't necessarily just a few days once a month, but actually there are changes in the body across the whole month that are linked to those changes, and at some parts of the month the body is different from others. Eventually one gets used to the fact that the body is pretty clever and it knows what it's doing and you don't have to think it through or get it all perfect, because your body will make it work as best it can. Also, the "am I really hungry?" question changes when one actually has a healthy, functioning body. If you're underweight, you are basically always hungry even if it doesn't always feel like it because you aren't used to treating your hunger properly. Then one expects something really dramatic to happen when one is properly hungry. When the body is healthier and more stable, "hunger" is not so dramatic. It's just a niggle that one deals with like an itch or something. It's not nearly as intense a feeling as I think I used to imagine it should be when I was underweight. I think it is really hard to explain or describe without just getting used to eating healthily ... and then it comes naturally .... It sounds so simple, doesn't it?! Sigh! Wishing everyone on this blog the very best.